Amlwch TownThe town of Amlwch, on the north-east coast of Anglesey, is a major draw for those interested in industrial heritage. Walking around this peaceful town, with its three windmills, it’s hard to imagine that in its mining heyday, it was one of the busiest ports in Wales, home to nearly 10,000 people and was the second largest town in Wales after Merthyr Tydfil. It grew rapidly in the 18th century near what was then the world's biggest copper mine at the nearby Parys Mountain. It was at this time that its harbour was also extended to accommodate the ships needed to transport the ore. When copper mining began to decline in the mid-1850s, shipbuilding became the main industry with many people also becoming involved in the ship repair and other maritime industries. The town was home to a brewing industry and also had tobacco works, producing the famous Amlwch Shag Tobacco - "Baco Shag Amlwch". At the peak of the copper mining, it is believed that Amlwch had a record of public house to person ratio, with there being one pub for every four people. 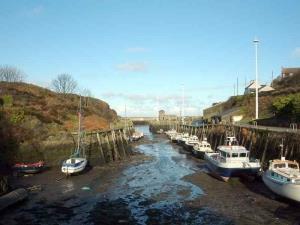 The town of Amlwch, on the north-east coast of Anglesey, is a major draw for those interested in industrial heritage. Attractions in Amlwch include the Copper Kingdom Visitor Centre, the Sail Loft, Parys Mountain Copper Mine, the Anglesey Coastal Path, St Eleth's Church (which dates from 1800) and the reinforced concrete Catholic church Our Lady Star of the Sea and St Winefride, built in 1937. The town's leisure centre has a swimming pool, sports centre and squash courts. Junction 8 of the A55 for the A5025 to Amlwch.